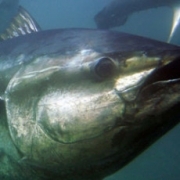 The National Marine Fisheries Service (NMFS) will close the Atlantic bluefin tuna (BFT) Angling category fishery for large medium and giant “trophy” BFT (measuring 73” or greater) in the southern area effective 11:30 p.m. local time, Monday, March 20, 2017, through December 31, 2017. The southern area is the area south of 39°18’N (off Great Egg Inlet, NJ), outside the Gulf of Mexico. Bluefin Tuna angling regions. South area (closed as of 3/20/17 to 12/31/17) highlighted in green. 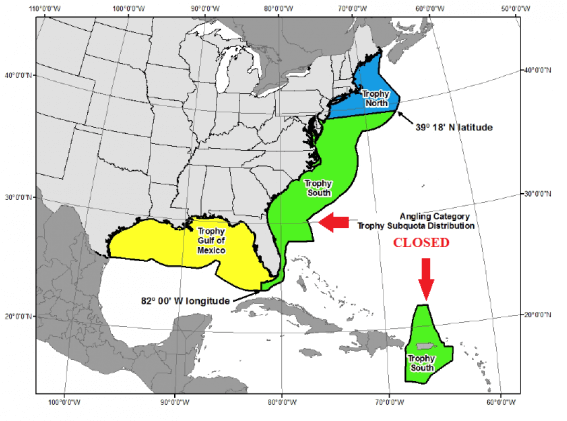 Based on reported landings from the NMFS Automated Catch Reporting System and the North Carolina Tagging Program, NMFS projects that the codified Angling category southern area trophy BFT subquota will be reached by March 20, 2017, and have determined that the trophy fishery should be closed in that area. Retaining, possessing, or landing large medium or giant BFT south of 39°18’ N. lat. and outside the Gulf of Mexico by persons aboard vessels permitted in the HMS Angling category and the HMS Charter/Headboat category (when fishing recreationally) must cease at 11:30 p.m. local time on March 20, 2017. The intent of this closure is to prevent overharvest of the Angling category southern area trophy BFT subquota. 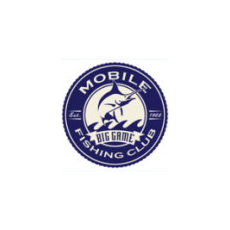 The annual Angling category trophy limit of one large medium or giant BFT per vessel remains in effect for vessels fishing in the northernarea and in the Gulf of Mexico area. 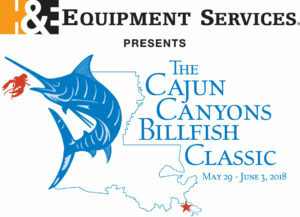 The Angling category fishery for BFT measuring 27 to less than 73” is open except in the Gulf of Mexico. Catch-and-release fishing is permissible as described below. REMINDER: Federal Regulations at 50 CFR 635.21(a)(1): Atlantic highly migratory species… that is not retained must be released in a manner that will ensure maximum probability of survival, but without removing the fi­sh from the water. This closure applies to vessels permitted in the HMS Angling category and the HMS Charter/Headboat category fishing in the southern area (defined in bold above). 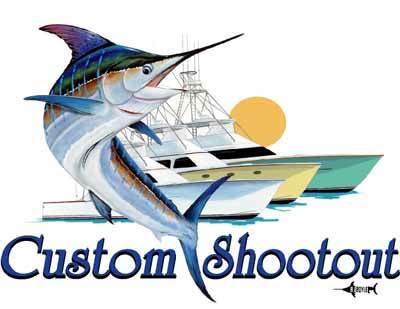 Fishermen may catch and release or tag and release BFT of all sizes, subject to the requirements of HMS catch-and-release and tag-and-release programs. NMFS regulations require that all BFT that are released be handled in a manner that will maximize their survival, and without removing the fish from the water. For additional information on safe handling, see the “Careful Catch and Release” brochure available at www.nmfs.noaa.gov/sfa/hms/. HMS Charter/Headboat and Angling category vessel owners are required to report the catch of all BFT retained or discarded dead, within 24 hours of the landing(s) or end of each trip, by accessing hmspermits.noaa.gov or by using the Android or iPhone app.